CB6 thinks the mitigation effort will fall short without major tweaks. A Manhattan community group says that the current plan for next year’s L-train shutdown will fall considerable short of what will be needed to efficiently move the 400,000 daily commuters who will be affected. In a strongly worded unanimous resolution last week, Community Board 6 told the city Department of Transportation and the state-overseen Metropolitan Transportation Authority that its plan [PDF] needs fairly significant improvements before the L-train shuts down entirely in April. “Are we concerned? You bet,” board member Larry Scheyer told Streetsblog, saying he was not authorized to speak for the full board, but was merely characterizing the general sentiment. “There was a lot of concern that not enough is being done to keep people moving on 14th Street,” he added. Other advocates and elected officials have also made 24/7 bus priority a key demand, arguing that it will be impossible to run 80 buses per hour through the affected area if the busway and other roadways are jammed. Elongate the proposed 14th Street “busway” east from Third Avenue all the way to First Avenue or Avenue C — and extending the “busway” hours to 24 hours a day instead of the current proposal of 5 a.m. to 10 p.m. Because the area east of Third Avenue will not be part of the proposed “busway,” that stretch “will bear the brunt of additional automotive traffic, including for-hire vehicles, thus hampering bus flow,” the resolution added. Reserve the Williamsburg Bridge for cars with three or more people and buses for 24 hours a day instead of the current proposal of 5 a.m. to 10 p.m. The resolution also urges the DOT to consider converting the Manhattan and Brooklyn bridges to HOV-2-only “during at least peak hours of commuting to stop single-occupant cars and [taxis] from using them to overwhelm the areas affected.” Currently, the plan proposes no changes to the other two free East River bridges. Ban taxis and private vehicles from 14th Street entirely, except for emergencies or cars heading to garages. Under the current plan, taxis would be allowed to make pick-ups and drop-offs on 14th Street, even during busway hours. Ban new construction within the affected areas until the end of the L train shutdown in July 2020 “to avoid further demands on overburdened streets,” the resolution states. Bar vendors from 14th Street, where sidewalks are expected to be tight. Streetsblog reached out to DOT, the MTA, the Department of Buildings and the Department of Consumer Affairs and will update this story when we hear back. Question: Will DOT consider converting the Williamsburg Bridge to HOV-3 and bus use 24-7 for the duration of the L shutdown? Answer: DOT studied traffic volumes over the Williamsburg Bridge and found that creating an HOV-3 restriction from 5 a.m.-10 p. m. (peak travel times) would result in crossing the most people over the bridge without creating congestion on the surrounding streets. DOT, along with NYCT will monitor traffic conditions throughout the 15-month closure and make adjustments as needed. Question: Has DOT studied converting the Manhattan and Brooklyn Bridges to HOV-2-only during at least peak hours of commuting, to stop single-occupant cars and taxis from using them to overwhelm the areas affected by the L? Answer: Analysis has shown that diverting trips to other East River crossings would create an increase in traffic volumes on these structures as well as their surrounding street networks. DOT will monitor and make adjustments as needed. 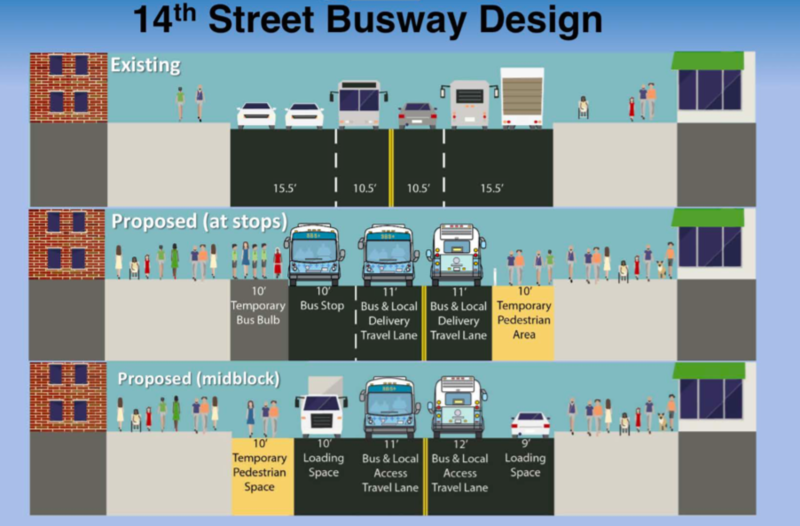 Question: Will the DOT extend the 14th Street “busway” eastward to First Avenue and/or Avenue C to minimize bottlenecks caused by private vehicles and taxis that could severely hamper ferry shuttle buses, etc.? Answer: DOT traffic analysis evaluated various options for the length of the proposed busway. Busway endpoints at First Avenue or at Avenue C would require all traffic to divert at those intersections, which created more significant traffic shifts than the proposed busway start/endpoint at Third Avenue. Once the reconstruction begins, DOT and NYCT will evaluate traffic conditions and will consider adjustments to the proposed plan as needed. Question: How about maintaining the 14th Street “busway” on a 24/7 basis for the duration of L train stoppage, since heavy L commuter patterns, especially on weekends, extend far beyond “busway hours”? Answer: Busway hours support period of highest traffic demand on 14th Street. Based on hourly traffic volumes on the Williamsburg Bridge and along 14th Street summarized, we do not consider the busway restrictions to be necessary for a full 24-hour day but will monitor and make adjustments as needed. Question: What about banning taxis and private vehicles on 14th Street 24/7 during the L shutdown because you know they’re going to be stopping and blocking buses. Answer: Taxis will be subject to the same rules as any passenger vehicle with respect to access to 14th Street. Taxis making a pick-up or drop-off along 14th Street would have to make the next right-hand turn off of 14th Street. This will be enforced via cameras and NYPD presence. Wow, so rare for a CB to speak truth to power, but yes, all this! As EV resident on Avenue A, i’m horrified our entire neighborhood will become a parking lot and buses will be even more useless (though even more needed) than today. Note that a local blog (EV Grieve: http://evgrieve.com/2018/09/nightmare-scenario-for-residents-who.html) also wrote a piece today about staging construction for tunnel repairs on eastern portions of 14th St, so forget a busway, this will be a full-on construction site. And then channeling all this construction traffic to & from Williamsburg Bridge through Avenue A… Quality of life and street safety concerns are one big problem, and the ability to move M14A & M14D is another. These buses will be in a horrible position and they serve so many people, especially older folks who are unable to walk to the subway at Astor Pl (6) or 2nd Ave (F). What a mess. “Limit truck deliveries along 14th Street to the hours between 5 a.m. and 10 p.m.” Do they mean between 10pm and 5am? Better to have delieveries during the lightly trafficked overnight hours. Wow, I’m shocked that the plan didn’t consider spillover onto nearby bridges. This city has got to get better at planning. Has the city ever been good at planning anything during most of our lifetimes? It seems we go from one crisis to another. Most of these so-called emergencies were caused by lack of planning. We can’t even figure out how to keep streets in good repair, much less manage the big stuff. So many idiots at meeting with trivial concerns or just there to speak to compliment MTA directors (shill speakers). Ignored the real problem that the excavation of tubes @ A will bring all traffic to a standstill and poison neighborhood. This is going to take 5 to 6 years. All of these proposals are unrealistic. This city is screwed. Has anyone, especially at the DOT and de Blasio and his cult at City Hall, given any consideration for a ferry to stop in Canarsie where the L train starts? They actually still have a dock there. The reason that the MTA can’t do the only logical option of making all of 14th St a busway is that they decided against all common sense to put their entire tunnel repair exit and entry all on Avenue A and 14th. Putting this gigantic enterprise on one of the busiest and most congested streets was a really horrible idea, and they should rethink this while they can. It will cause a domino effect in all directions. How about a ban on honking WITH AGGRESSIVE TICKETING between 14th St and Canal. Other cities have banned honking, and it would be an easy and positive move to alleviate some of the phenomenal and unnecessary noise this area will be experiencing. A ferry would take significantly longer than existing subway options from Canarsie to virtually any point in Manhattan. Most Manhattan-bound L riders from Canarsie already transfer at Broadway Junction, and they’ll continue to do so during the shutdown. A ferry might make sense for those living and working very close to the two ferry docks, but that’s surely a very small number – once you have to transfer at one or both ends, you’re better off taking the L to Livonia, Broadway Junction, or Myrtle-Wyckoff and transferring. In case you weren’t aware (surprisingly many aren’t! ), the L will be running its regular route in Brooklyn, and will even have an extra transfer option at Livonia to the 3 train. And there will be a new bus to Utica on the 3/4, too. A ferry doesn’t make sense here. I am aware, being a citizen of New York and a commuter all my life. Since you are not aware, at a town hall around there which Byford attended, the community actually wants a ferry there and when they questioned Andy he demured and had no response to it. Maybe it’s because the city in total obeisance to their developer overlords who are looking more every day behind this service, since it stops in wealthy, gentrified and gentrifying areas, don’t want the fine people that live in Canarsie to board their ersatz yachts. DOT is stonewalling, but leaving themselves an out to make everything 24/7 for when their underprovisioned plan is an overnight disaster. The last city “plan” was in the 1920s, right? You kinda have to wonder why Bushwick keeps getting the short handlebar. DOT and the MTA are holding a series of public workshops to inform the plan to keep people moving during the L train shutdown. This is your chance to speak up for transit-priority streets, protected bikeways, and expanded pedestrian space.